WASHINGTON, July 12, 2017 — One of the largest icebergs ever recorded, easily among the top ten, has just broken away from the Antarctic ice shelf. The event has fueled the fears of environmental advocates. The giant block is estimated to cover an area of roughly 6,000 sq km, about a quarter the size of Wales. 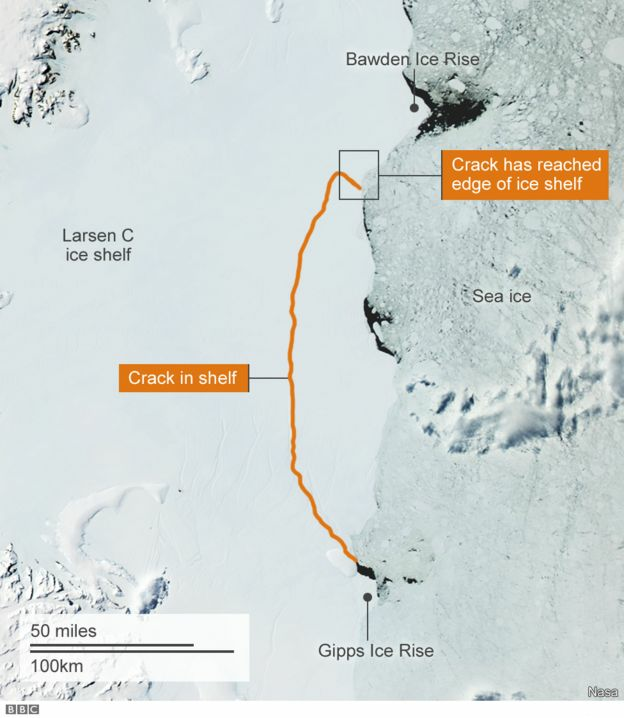 For more than a decade, scientists have been following the development of a large crack in the Larsen’s C Ice Shelf. It is named for Captain Carl Anton Larsen, of the Norwegian whaling vessel Jason, who sailed along the ice front as far as 68°10′ South during December 1893. The Larsen’s C shelf is a mass of floating ice formed by glaciers that have flowed down off the eastern side of the Antarctic Peninsula into the ocean. On entering the water, their buoyant fronts lift up and join together to make a single protrusion, that will eventually, and naturally, break off. Glacier-ice shelf interactions: In a stable glacier-ice shelf system, the glacier’s downhill movement is offset by the buoyant force of the water on the front of the shelf. Warmer temperatures destabilize this system by lubricating the glacier’s base and creating melt ponds that eventually carve through the shelf. Once the ice shelf retreats to the grounding line, the buoyant force that used to offset glacier flow becomes negligible, and the glacier picks up speed on its way to the sea. The breaking of the ice shelf creates a free-floating iceberg. This is a natural process for the ice shelf. It maintains the ice shelf’s equilibrium by breaking off large pieces of it in order to balance the accumulation of mass from snowfall and the addition of more ice from the feeding glaciers on land. It is not a reason for panic or for protests outside the White House. Overview of areal changes of the ice shelves on the Antarctic Peninsula over the past 50 years as of 2014. The Cryosphere Discussions. 3 pp579-630. URL: http://www.the-cryosphere-discuss.net/3/579/2009/tcd-3-579-2009.pdf, Image cropped from screenshot of original work. The American space agency’s Aqua satellite has reported seeing clear water in the rift between the shelf and the berg this morning. The water is warmer relative to the surrounding ice and air, both of which are sub-zero. “The rift was barely visible in these data in recent weeks, but the signature is so clear now that it must have opened considerably along its whole length,” explains Prof. Adrian Luckman, whose Project Midas at Swansea University has followed the berg’s evolution most closely. Since 2014, scientists have been noting the increased calving of ice bergs from the ice shelf. The Larsen Ice Shelf is a series of shelves that occupy distinct embayments along the coast. From north to south, the segments are called Larsen A (the smallest), Larsen B, and Larsen C (the largest) by researchers who work in the area. Further south are Larsen D and the much smaller Larsen E, F, and G.
There is no immediate threat from the more than 200m-thick tabular berg because it will not move very far or very fast in the short term. However, currents and winds might eventually push it north of the Antarctic, where it could become a hazard to shipping. The event was confirmed by other spacecraft, including Europe’s Sentinel-1 satellite-radar system. In 2000, a large piece of the Ross Ice Shelf, which measured some 11,000 sq km broke away. Fragments of this super-berg were still visible near New Zealand in 2006. The Larsen C Ice Shelf has calved previous super bergs, with a piece measuring approximately 9,000 sq km breaking away in 1986. Some pieces were trapped in the plastic gyre in the Weddell Sea, as well as in the South Atlantic. “… scientists think Larsen C is now at its smallest extent since the end of the last ice age some 11,700 years ago, and about 10 other shelves further to the north along the Peninsula have either collapsed or greatly retreated in recent decades. “The two nearby, smaller shelves, Larsen A and Larsen B, disintegrated around the turn of the century; and a warming climate very probably had a role in their demise. “‘The signs we saw at Larsen A and B—we’re not seeing yet. The thinning we saw for Larsen A and B—we’re not seeing. And we’re not seeing any evidence for large volumes of surface meltwater on the order of what you would need to hydro-fracture the ice shelf. The crack, which spread across the shelf from a point known as the Gipps Ice Rise was of concern as it was feared it would move behind the Bawden Ice Rise. That could have prompted a significant speed-up in the shelf’s seaward movement, allowing glacier snow to enter the water, melt and possibly impact sea water levels. As it is, scientists are not expecting a big change in the speed of the ice or the increase of water levels as a result of glacier snow and ice entering the water. 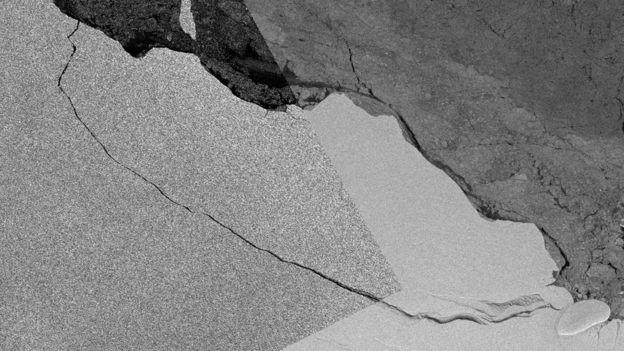 A strip of “warm”, malleable ice that runs east-west through the shelf, reaching the ocean edge about 100km north from the Gipps Ice Riseknwon as the Joerg suture zone will be studied as the iceberg moves away from the shelf. “Calving of the iceberg is not likely itself to make the existing cracks at the Joerg Peninsula suture zone more likely to jump across this boundary,” observed Chris Borstad, from the University Centre in Svalbard (UNIS). “At this stage we really don’t know whether there is some larger-scale process that might be weakening this zone, like ocean melting at the base of the shelf, or whether the current rift was just a random or episodic event that was bound to happen at some point. “We know that rifts like this periodically propagate and cause large tabular icebergs to break from ice shelves, even in the absence of any climate-driven changes. President Obama asks Congress for permission. Why?